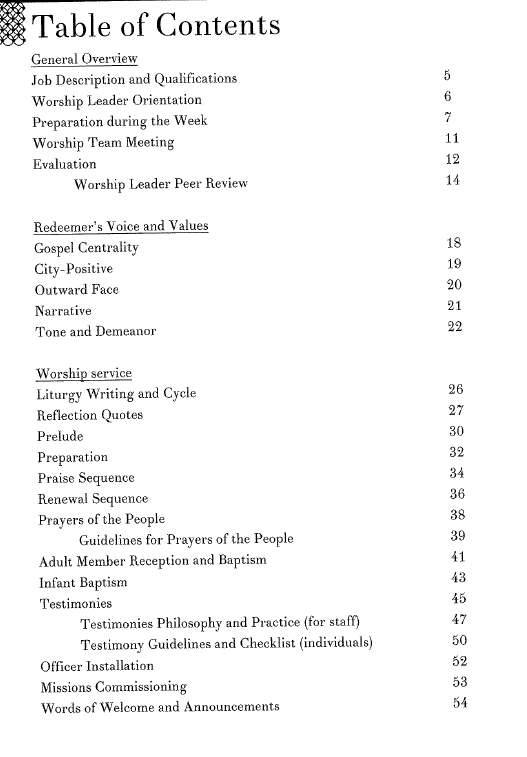 Redeemer Presbyterian Church, New York recently published a working document on all things worship leading at Redeemer. This publication has been in the works for years and it is a clean and helpful look into the policies and procedures of worship leadership at Redeemer. 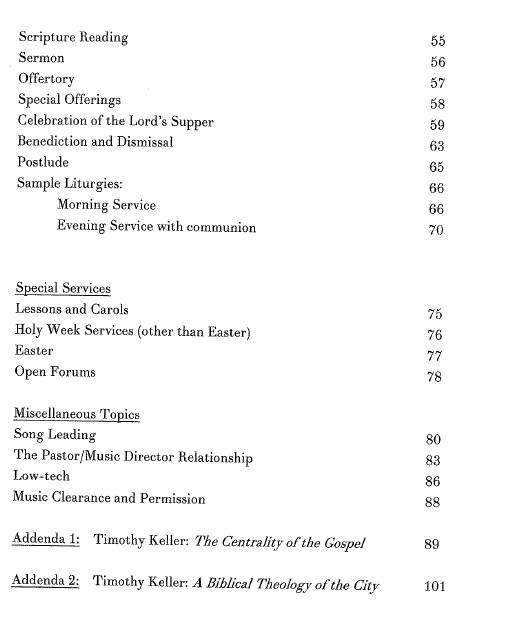 Tom Jennings, the Director of Worship and Arts at Redeemer for the last 15 or so years edited and crafted the document. Here is a glimpse at the Table of Contents. I would highly commend picking up a copy of this HERE for use in thinking through elements of a service, service review, performance review, special services, etc. The article on the Pastor/Music Director relationship is worth the price alone! Catechism Q4 What is God? You beat me to it! I hope to do a bit of a review, soon, but I welcome your thoughts! I think it’s a great resource. The pentecostals would flip, but it’s an organizational Presbyterian’s dream. Mmmm….decently and in order. Yum. z, looking forward to reading your review! I picked this up a few weeks ago, but haven’t looked at it yet. Super excited about it. And what a delightful cover. I stumbled upon this post but it looks like the manual is out of print. Any thoughts on where I can get it? Were you able to track it down anywhere? I’d love to check it out too! ryan, join liturgy fellowship on facebook. Someone posted a pdf of it.